NEW YORK, Feb 20, 2015/ — Inspired by the spirit of Europe’s wild men and fictional character Luke Skywalker of Star Wars, Mara Hoffman created a bridge between reality and fantasy, connected Earth to the sky and crossed the line between civilization and wilderness. 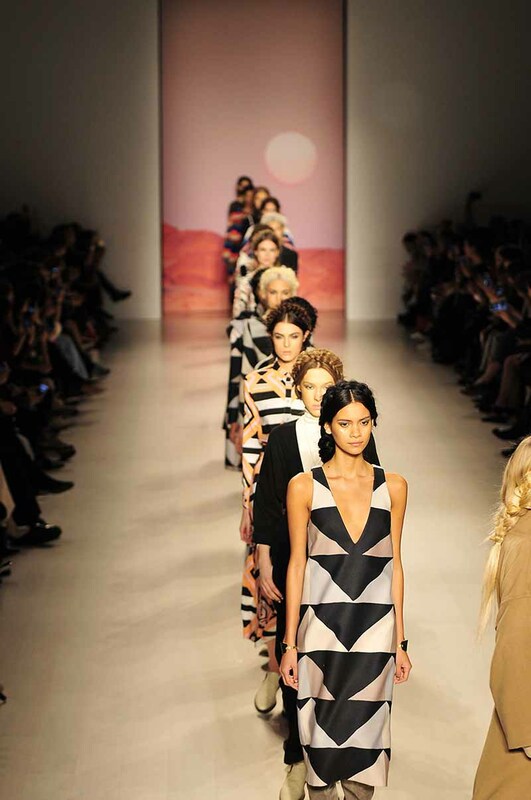 With a background that is reminiscent of Luke Skywalker’s home planet Tatooine, Mara Hoffman sent out coats in seven shades of the desert, striped poncho dresses, long-sleeved turtlenecks in the brand’s signature prints and oversized shawls in black and white. In doing so, she expanded last season’s color palette. The Fall 2015 collection combines a strong neutral story, consisting of camel, cream, black and white. Giving a nod to the metallic trend this season, Mara Hoffman proposed metallic geometric embellishments, black crepe fabrics, and chiffon tufting appliqués. The collection is texturally balanced with the use of fringe and luxe wool-coating throughout a wide range of coats and sweaters. “This collection is about keeping your feet on the ground, hands in the sky, and allowing the force to be with you at all times,” commented Mara Hoffman on her press notes.